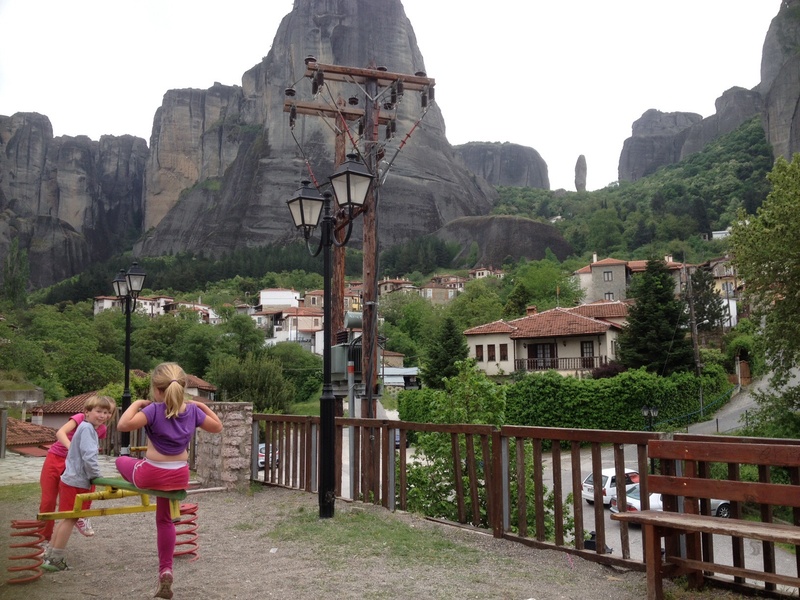 Meteora – cliff top monasteries in Central Greece. 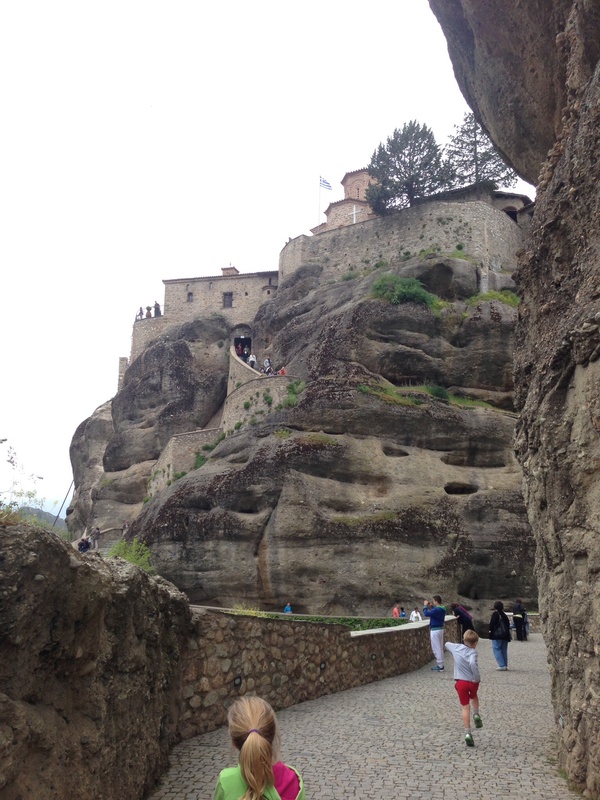 The rocks were wonderful, with epic views on the way as well as from the monasteries. I felt really confident on these rocks, more than I do on some rocks and there was so much space around. It was good to have a long morning walk, then get into the car and rest. We had a well deserved icecream at the end. 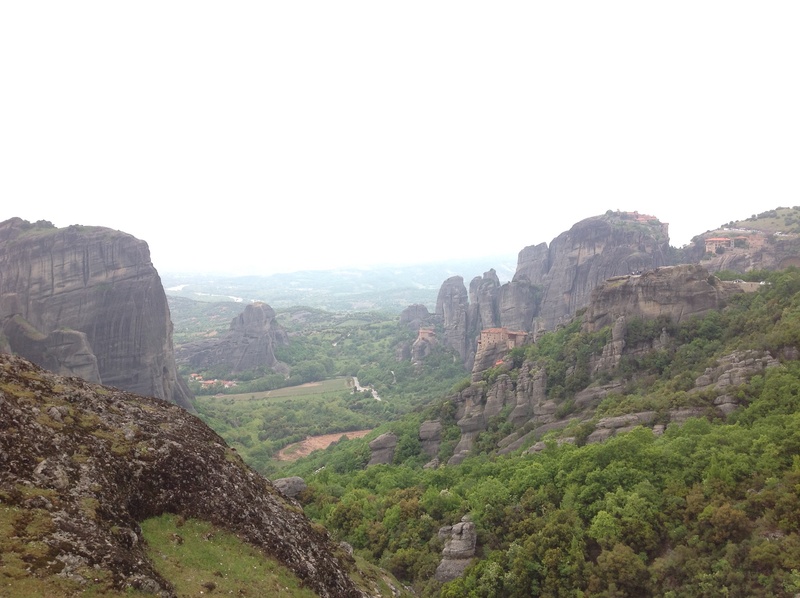 The rocks that we went on today were very spectacular. I was ahead and when I was waiting for the others, I was climbing the rocks. 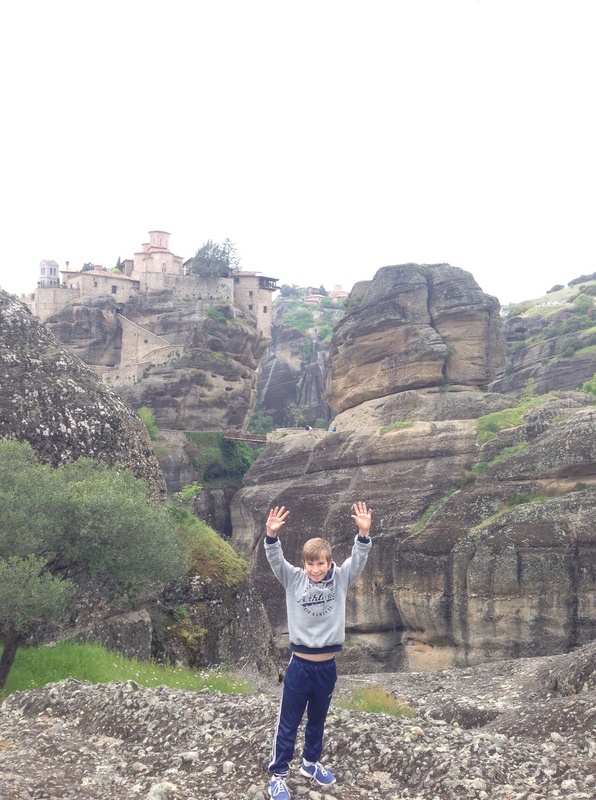 To get to one of the monasteries we climbed up one hundred and twenty five steps. After the best walk I was sad to get into the car because walking was so lovely. Walking long distances makes me wild with energy. 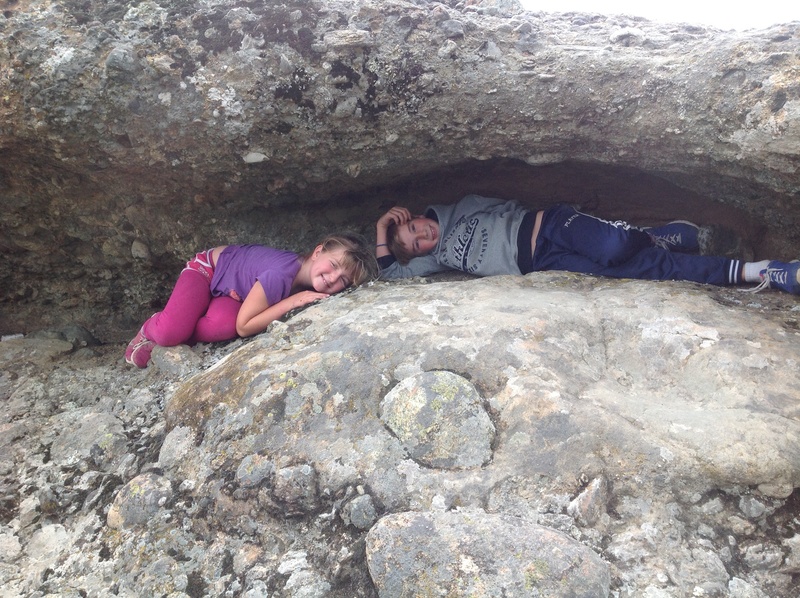 When we were in the car we stopped somewhere for photos and Toby and I hid under a small rock overhang and got Zoi and Emilio to ask mum ‘Where are Toby and Kalika?’ She found us. After that we had an ice-cream – I had a cookies and cream magnum. Then we went to a cafe and mummy and baba had a coffee. We saw two rock climbers on a big surfboard shaped rock I said ‘ that it looked like two tiny ants on a huge surfboard’. After that we played in the park. And now we are driving back to the village. Bye bye. Hello this is Emilio, on these rocks we were having an epic time. We went inside a rock with stairs. 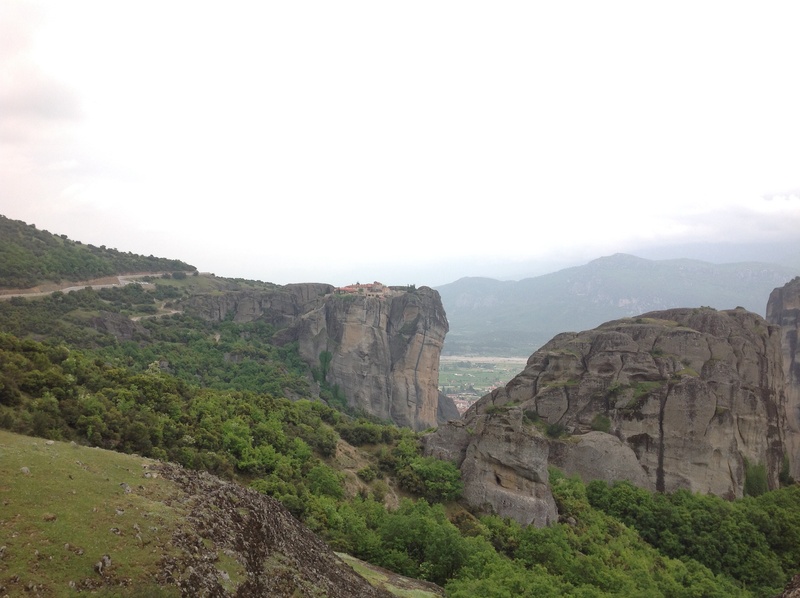 We went to a monastery and then we went back down to our car. 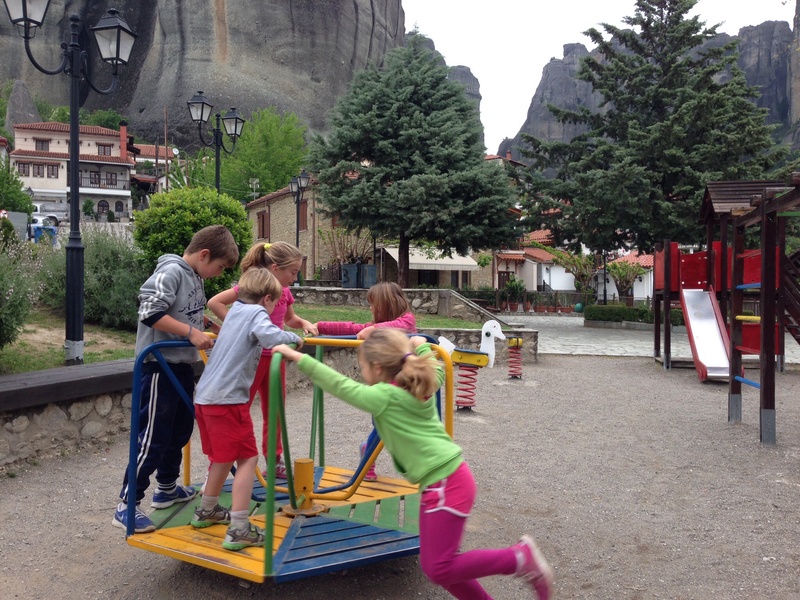 We went back down to the town got our car and drove up a rock. 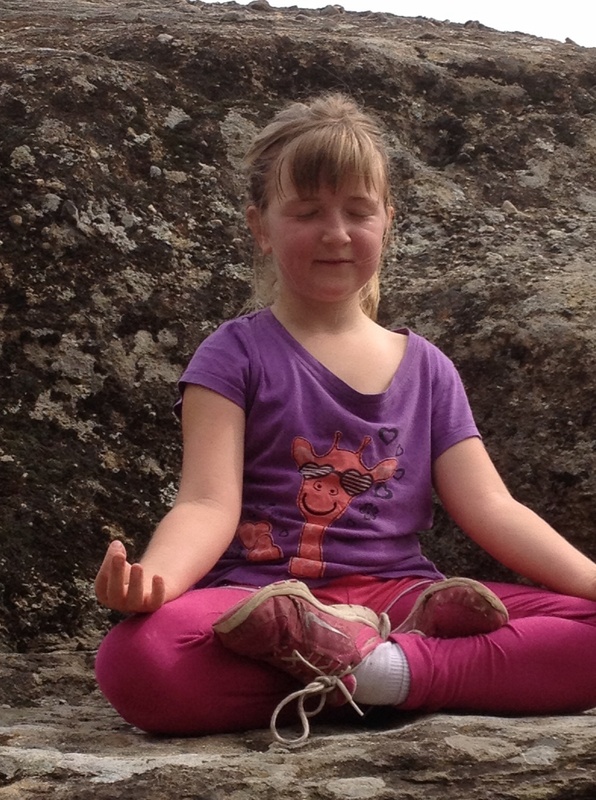 We were stopping at lookouts and climbing rocks. Then we got an icecream. Then we went to place for mum and dad to have a coffee and a treat. They shared it and we shared our icecream. We saw climbers on a big surfboard shaped rock a long way away. It looked like there was a big surfboard and a tiny guy surfing. We found a park and played. Then a boy came over to ask if we wanted to played soccer. Toby played with him. But the ball went a long way down the road. So then I got hurt and so did Zoi and then the Greek boy walked back up with the ball and Toby said ‘preppi na figo’ – ‘I need to go’. We got in the car, we’re still in it, it’s a long drive. It was so nice to get out on the road again in a more independent way. Christos and I always remark on how good it feels to be ‘getting out’. 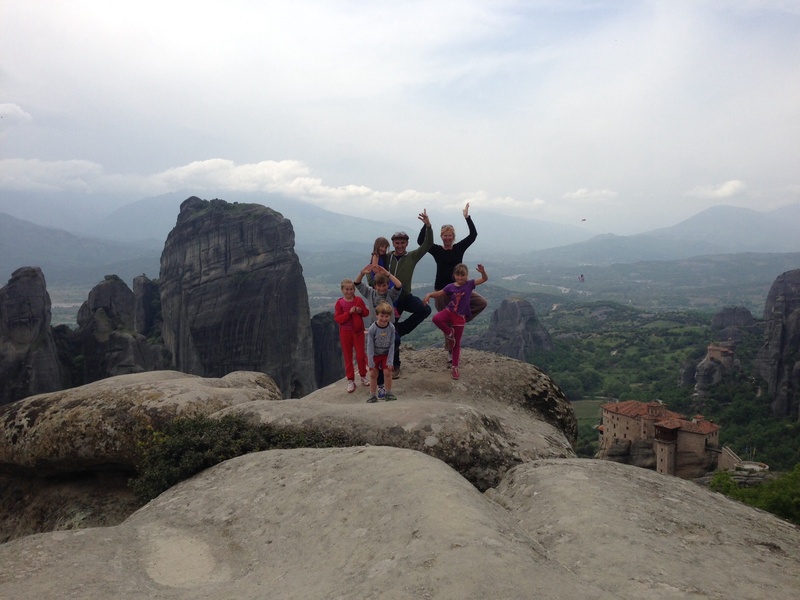 We have come to a place called Meteora. 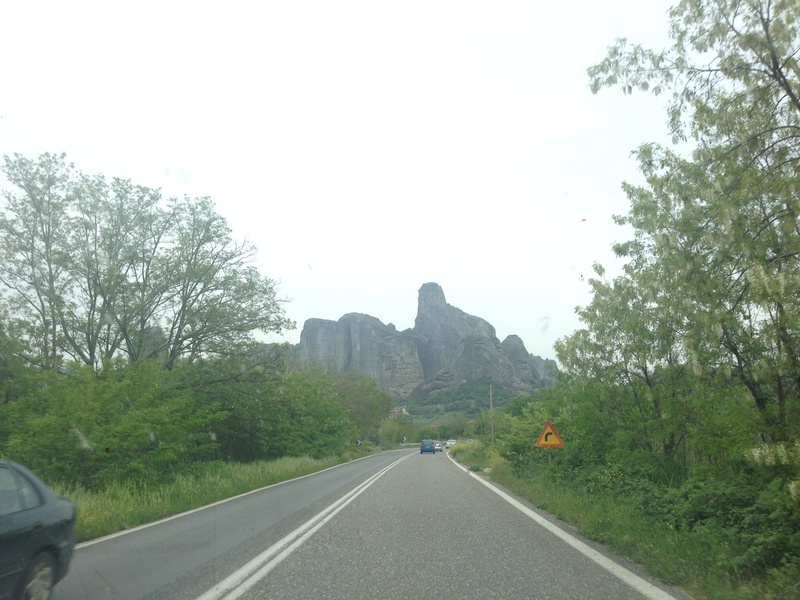 It is an area of cliff top monasteries and nunneries about 3 hours drive from the family village in northern Greece. 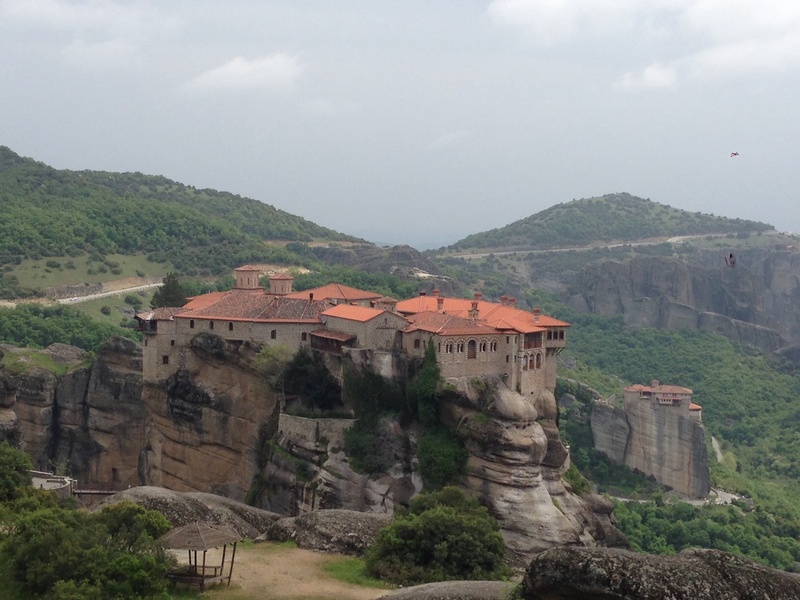 There are six main monasteries on the map with hundreds of crosses, worshipping places and the like in hidden crevices, all accessible by car but also walkable for a much more inspiring experience. 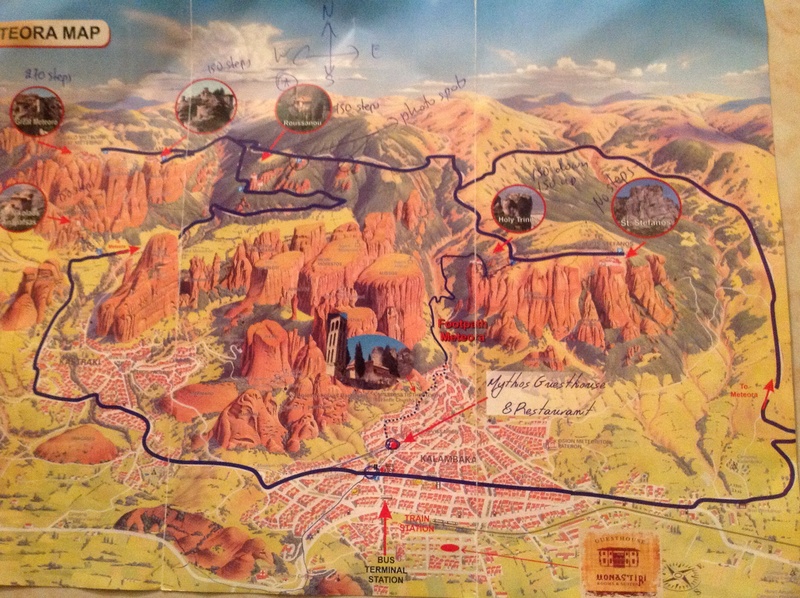 If you look at the map Christos has copied, we stayed at Kalambaka in an awesome little place. It was the best shower I’ve had since being away and I would’ve taken photos of it to mark this memorable occassion if all the tempting bits worked: like the shower head didn’t work nor the holder for the handheld shower head. But most importantly the water was hot, with good pressure, the whole bathroom didn’t get wet in the process, it wasn’t freezing getting out and the hot water didn’t run out! Wow I didn’t realise how much showers mean to me. Needless to say neither the shower in the village or our home in Crete can offer the pleasures of that shower on April 21! Anyway, I was writing about our ‘ekdromi’ excursion wasn’t I? Amazing rocks. Composite in nature and Toby swears sedimentary also. Although we haven’t read about their formation the lady in the coffee shop said they were once at sea level and that as the sea withdrew at the end of the Ice Age, the softer rock has slowly been eroded and washed away. 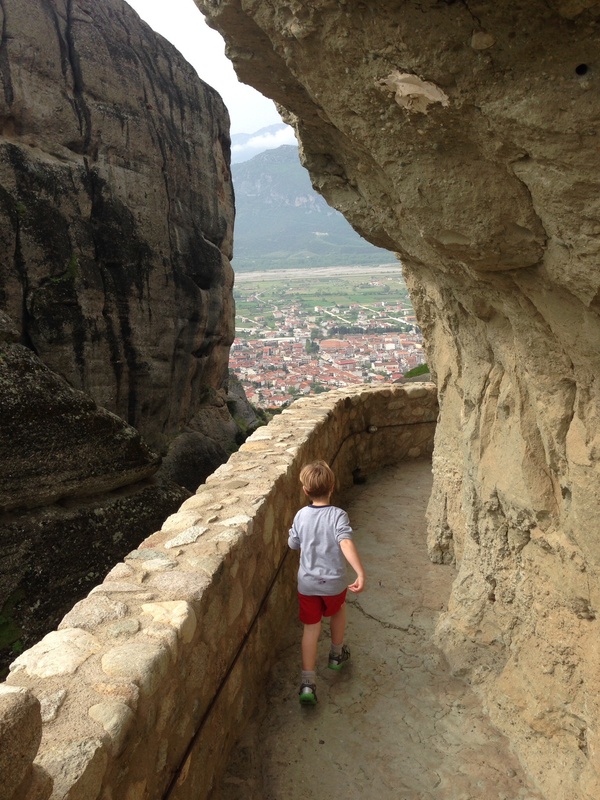 The path ways too and from each monastery are worth long pondering and marvelling minutes. 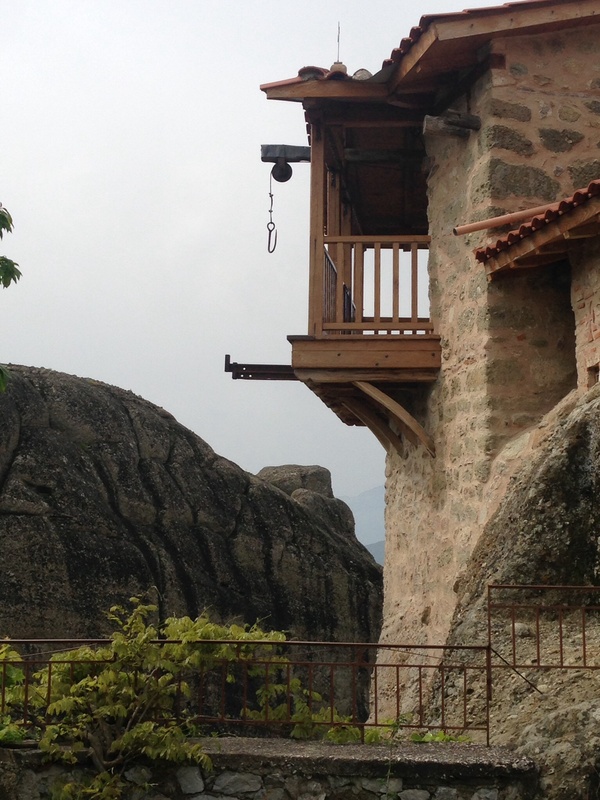 The intricacies of rock work and use of wood create an inspiring aesthetic. Christos and I took many photos- the dreams we have of evolving more creative space outside in our Whitfield home are cumulating. We don’t know much about the cultural or religious history here sorry, but I did ponder the sacredness of places in different cultures, we discussed Ayers Rock and it’s size, what is sacred and how different people/cultures/beliefs mark sacredness. We also discussed prioritising and ‘timing’ for jobs and things we want to do when we get back home! 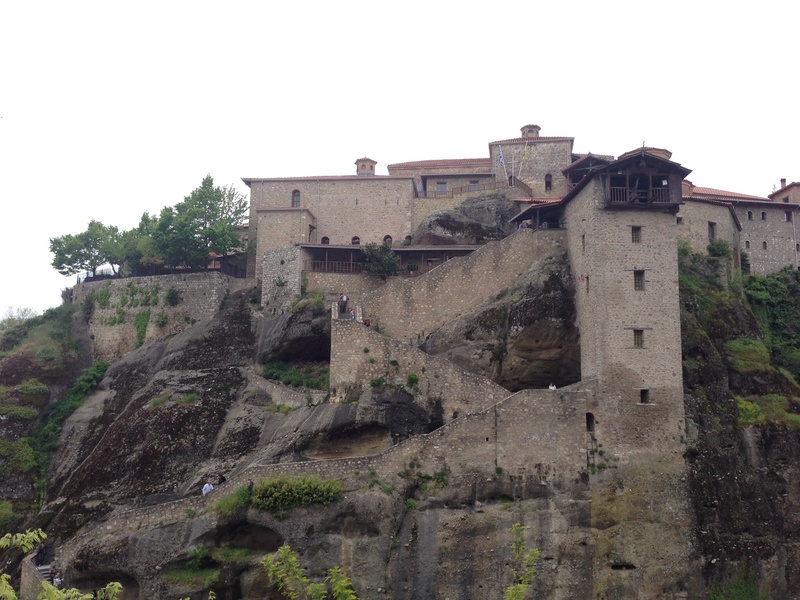 It is not unusual that churches and monasteries have prime real estate. The views were impeccable, as for location however I don’t think they would fetch a good price due to commuter difficulties. Hmmm where was I ? We left the village which has been cold to the point of quite heavy snow a week ago, to being too hot for blankets as we fell asleep last night. The rocks behind our colourful ’50’s meets antique Chinese meets rustic with fantastic bright feature walls and dark chunky wood’ guesthouse were stunning and inspiring ( how many colourful walls veto the concept of a ‘feature’ wall- every wall including the chimney were brightly painted – it had a fabulous feel with coloured glass lights and groovy tidbits all over the place). Back to our little jaunt; great to get sweaty and feel calf muscles under strain. Also nice to still feel relatively fit. As I think back to our early walks in Oz, sometimes there were complaints at the thought of a few hours walk (admittedly it was hot), comments were made by friends saying ‘goodluck on hikes’ about certain kids… now I am happy to report that the whole Miliking team are excited about getting out bush, it is a guaranteed hit. ‘Epic!’, and ‘I feel alive on rocks’ are the most common response now. 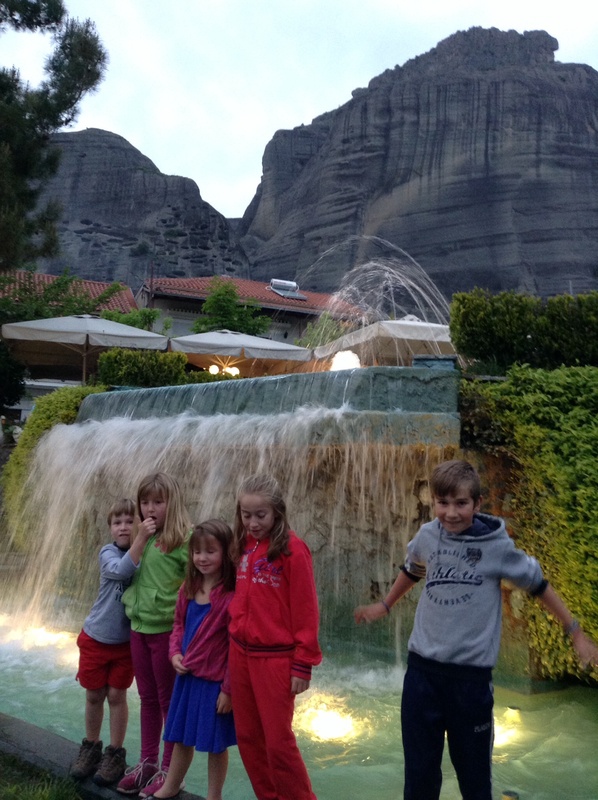 It is so nice to hear, Christos and I love a wander and a bit of hard walking for that exhilaration of getting immersed and ironically ‘stopping’ in a way – and sharing this passion with the kids fills our souls. So the walk for the day over, there is not as much sleeping in the car as I would have imagined. There are not a lot of opportunities to get out of the village or our town in Crete, hiring a car is a luxury, but we relish every moment. I hope you too are relishing your every moment today.